Chaos, catastrophe, self-organization, and complexity theories (nonlinear dynamics) now have practical and measurable roles in the functioning of work organizations. 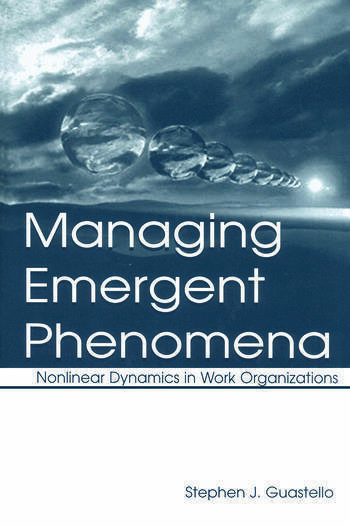 Managing Emergent Phenomena begins by describing how the concept of an organization has changed from a bureaucracy, to a humanistic and organic system, to a complex adaptive system. The dynamics concepts are then explained along with the most recent research methods for analyzing real data. Applications include: work motivation, personnel selection and turnover, creative thinking by individuals and groups, the development of social networks, coordination in work groups, the emergence of leaders, work performance in organizational hierarchies, economic problems that are relevant to organizations, techniques for predicting the future, and emergency management. Each application begins with a tight summary of standard thinking on a subject, followed by the new insights that are afforded by nonlinear dynamics and the empirical data supporting those ideas. Unusual concepts are also encountered, such as the organizational unconscious, collective intelligence, and the revolt of the slaved variables. The net results are a new perspective on what is really important in organizational life, original insights on familiar experiences, and some clear signposts for the next generation of nonlinear social scientists. Contents: Preface. Scenes From the Nonlinear House of Panic. Nonlinear Dynamical Systems Theory. Structural Equations. Organizational Change and Development. Nonlinear Motivation Theory. Dynamical Theory of Creativity. Social Networks. Work Group Coordination. The Emergence of Leadership. Work Flows in Hierarchies. Nonlinear Economics. Dynamical Systems. Epilogue: Whatever Happened to Everything? Appendices: Data Analysis With Structural Equations. The Island Commission Game.